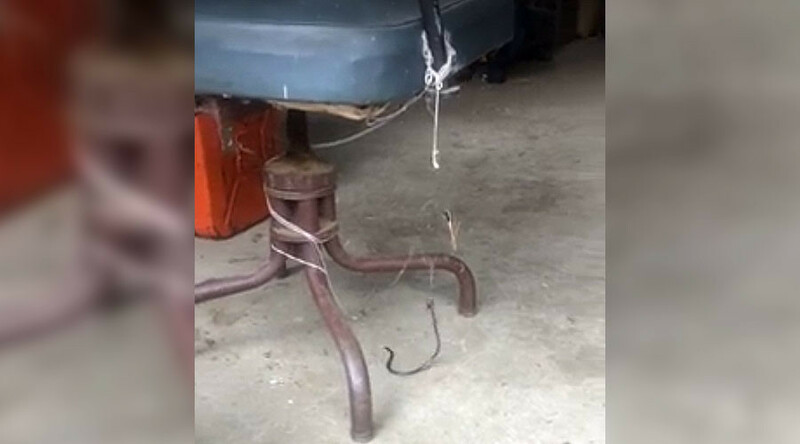 The moment a deadly redback spider kills a red belly black snake ten times its size has been captured in rare footage taken in Sydney, Australia. “Welcome to Australia where almost everything here will try and kill you,” wrote one commenter on the video which shows the poisonous red back spider and baby snake locked in a fight to the death. The video, which has been viewed more than 15,000 times, shows the two creatures locked in a fight, the snake swinging from the little spider’s grasp as it delivers venomous bites to the serpent. Red bellied black snakes are poisonous and can grow as large as 2.5 meters. Its bite causes nausea, diarrhoea, weakness and muscle damage in humans. There is no record of a human dying from a red bellied black snake bite. Redback spiders on the other hand, are one of Australia’s deadliest creatures. They deliver strong venom through their fangs before wrapping victims in a web and sucking out their liquefied insides. Although about 2,000 people report being bitten by Redbacks each year, since the creation of an antivenom in 1956, no deaths have been recorded.